Having already insured over 20,000 UK businesses, and with our customer base growing significantly each month, CoverSupermarket has established itself as one of Britain's leading insurance comparison provider for cheap insurance. As business insurance specialists, we could make insuring your business and other insurance products, easier and cheaper. We employ people who understand business insurance, and you can arrange everything online or in a single telephone call. Whether you are an independent retailer, hotelier or a landlord, we compare insurance policies to suit your needs. And with our policies covering a range of risks from business contents to employers' liability, you can tailor the cover to give you just what you require. 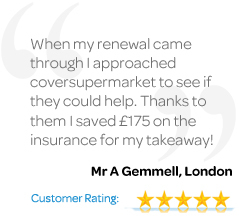 At CoverSupermarket, we'll use our experience to tailor a policy to your precise requirements - all for a cheap insurance premium and with no compromise on the level of service you receive. We also offer a whole range of optional cheap insurance cover which you can chose to include with your standard cover. By using our insurance comparison CoverSupermarket makes arranging your business insurance easy! Simply by completing our online questionairre you can get an insurance comparison and buy your insurance online. And our installment payment plans let you spread the cost of your cover. We can even arrange for a single policy to cover your business over the telephone in a matter of minutes And we'll send out clear concise policy documents within seven working days. With lower rates on cheap insurance, there is every chance that with CoverSupermarket you could enjoy the level of same level of cover you require at a much lower price than you currently pay. Select Insurance Category Hotel & Pub Insurance Restaurant & Food Insurance Shop & Retail Insurance Office Insurance Landlords Insurance Liability Insurance Please select an item. Hotel & Pub Insurance Types Public House Insurance Bar Insurance Holiday Flats Insurance Social Club Insurance Hotel Insurance Guesthouse Insurance Casino Insurance Nightclub Insurance Gentlemens Club Insurance Please select an item. Restaurant & Food Insurance Types Restaurant Insurance Takeaway Insurance Cafe Insurance Takeaway Delivery Insurance Fish & Chip Shop Insurance Please select an item. Landlords Insurance Types Residential Property Owners Insurance Commercial Property Owners Insurance Please select an item.